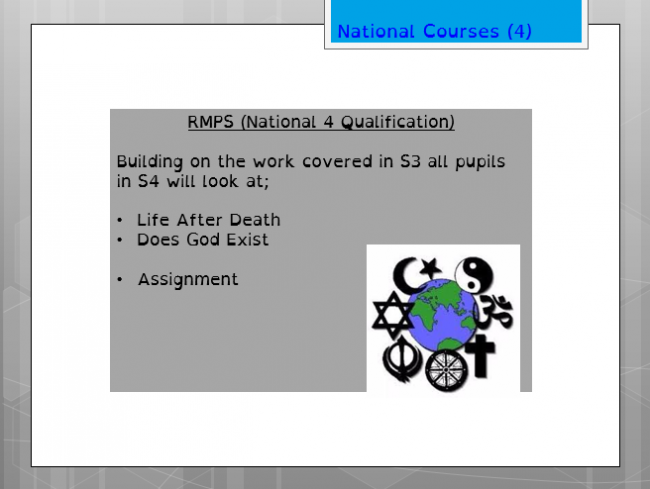 Welcome to Social Subjects and RMPS! Pupils in S1 and S2 visit the faculty three periods a week. They follow a thematic course to allow fully integrated Social Subjects. 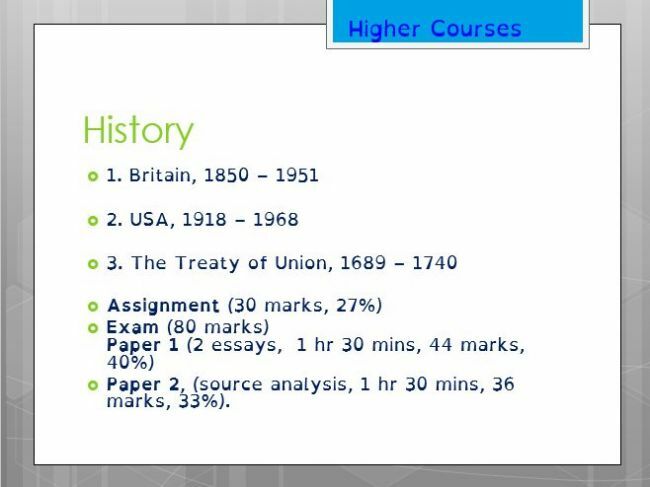 The means that all topics will cover some History, Geography and Modern Studies. The first topic is set in a local context, Scotland, before moving internationally to the USA, before concluding with the continent of Africa. 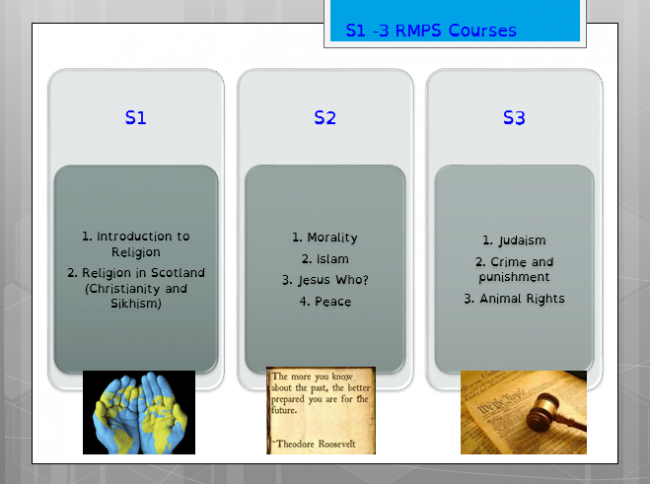 Pupils visit RMPS one period a week from S1-3. They study a range of topics which are highlighted below. Pupils can choose to specialise in one or more of the Social Subjects from the beginning of S3. 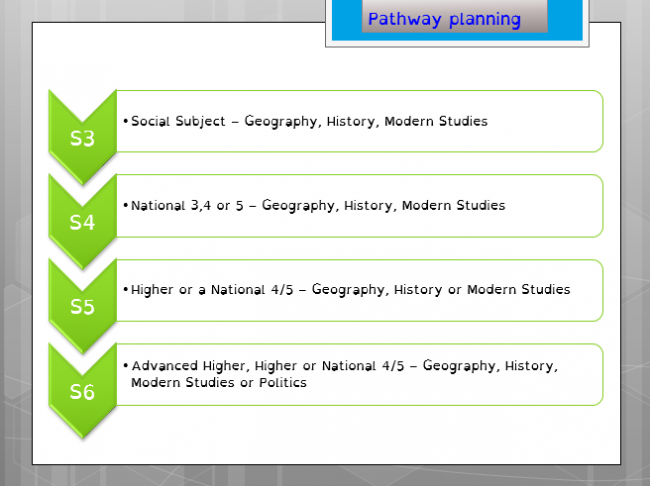 There are various options for pupils’ pathways as summarised below. 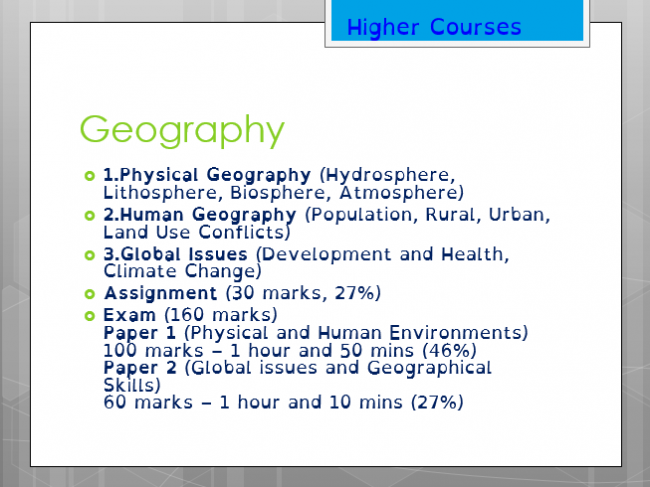 National courses: A summary of the main topics for each of the three Social Subjects are shown below. 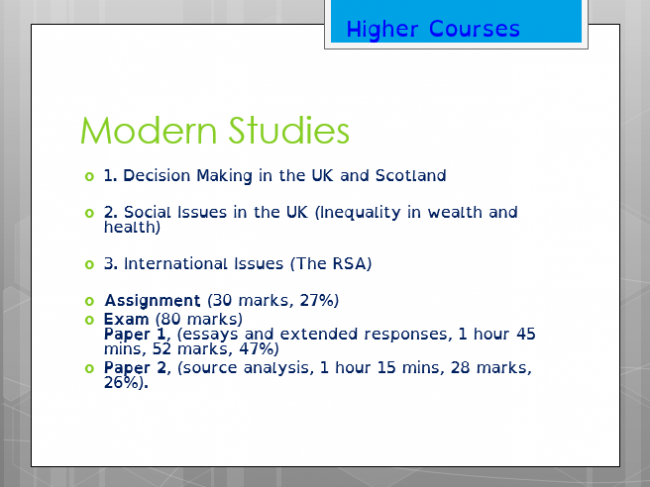 Higher courses: A summary of the main topics for each of the three Social Subjects are shown below. We are committed to ensuring that this year is a success for your child and as such we are keen to clarify what we expect from pupils and also what pupils can expect from us across the year. How can parents/carers support their child with Senior Phase courses? Looking ahead - We are currently in the process of looking to increase the breadth and choice of experiences pupils can have in Social Subjects. This may include the delivery of new qualifications in future years including National Progression Awards and National Certificates. 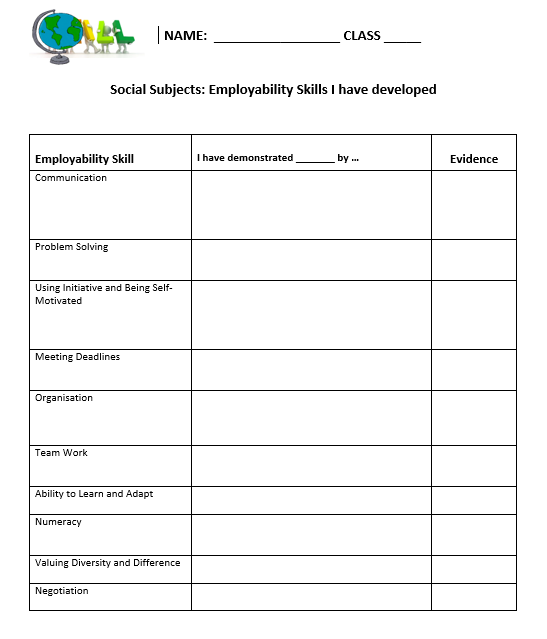 Throughout Social Subjects and RMPS, pupils are encouraged to take time to think of the employability skills they have been developing. Our faculty approach to learning and teaching equips our pupils with the skills needed for learning, life and work. An example of the skills review table we use with our BGE classes is shown here. All learning and teaching programmes in the faculty are planned to incorporate activities which meet different learning styles. This includes literacy and numeracy tasks, individual and group based activities, research, debates and presentations. Pupils learn in a variety of ways including through the use of textbooks, PowerPoint presentations, ICT and documentaries. Our goal is to make sure that work is suited to each pupil, ensuring those who may have difficulties in accessing the curriculum are given work appropriate to their level, whilst also adding appropriate challenge to help all pupils reach their potential. Each year we have many visitor speakers to the faculty, including representatives from the British Red Cross, Edinburgh Council, Saughton Prison, Gideons International and Youth for Christ. These school partnerships help to enhance pupil experiences in Social Subjects, whilst also highlighting links with potential future employers. We also organise fieldtrips for Geography classes and run a Battlefields trip to Belgium for BGE classes. These opportunities provide a real context for learning. Pupils are always encouraged to actively demonstrate the school values and try their best in class. In the faculty we promote positive behaviour in a number of ways. We employ a positive behaviour strategy called “Secret Student” whereby one pupil is randomly chosen to be the Secret Student (only the teacher knows the identity of the Secret Student) and the teacher observes their effort, behaviour and general conduct throughout the lesson. If they are successful this is announced at the end of the lesson and their name is added to a display board in the corridor. Communication with home – Texts are regularly sent home to parents/carers of pupils who have impressed us with their attitude/effort/work. We have recently launched a token based system, whereby pupils can be awarded 1 house point for a great answer/action demonstrating our school values, 5 points for their house if they are Secret Student and 10 points for whole class recognition if they have worked well together and had a great period. We keep a record of this weekly and display, in the corridor, graphs to show each house’s progress. Supported Study – All departments within Social Subjects offer support to help pupils with their progress. Check in with individual subject teachers to find out what days/times are on offer. 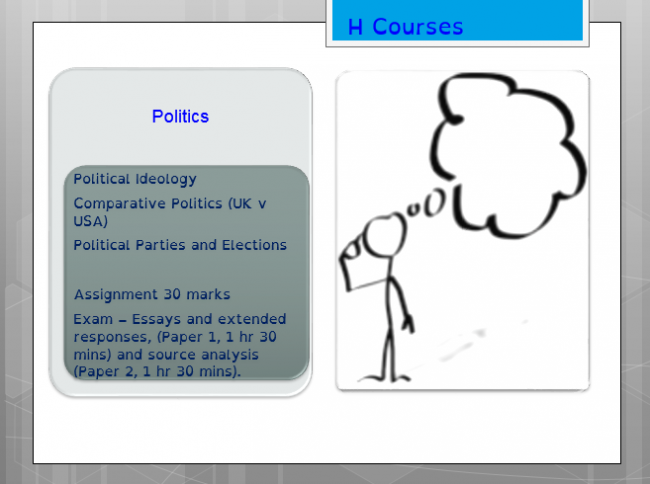 Bitesize – for all Social Subjects at both National and Higher level. 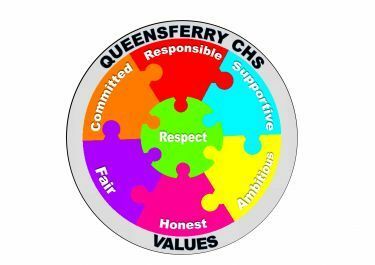 SQA – Past papers are available to download for free. S1-3: Choose either a current news story (e.g. Protests in Iran), historical event/individual (e.g. Martin Luther King Jnr) or Geographical issue (e.g. Plastic in the ocean) and create an A4 information sheet on this topic (this can be a combination of text and images-pictures/diagrams). 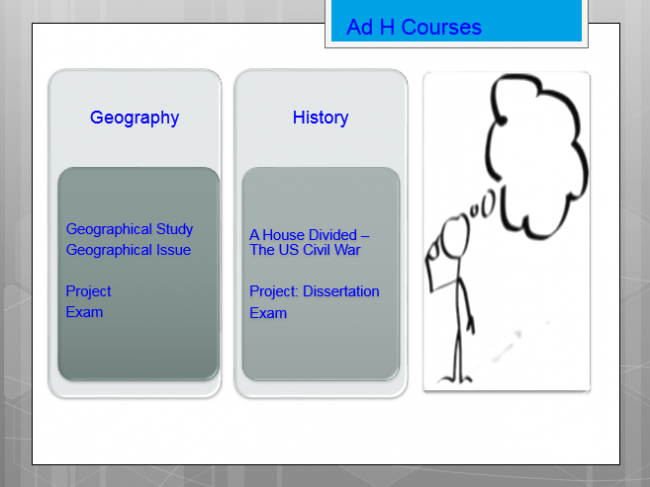 Now create 10 multiple choice questions (a,b,c) to help check the understanding of anyone reading your profile. You should also include the correct answers at the bottom of you piece of work.